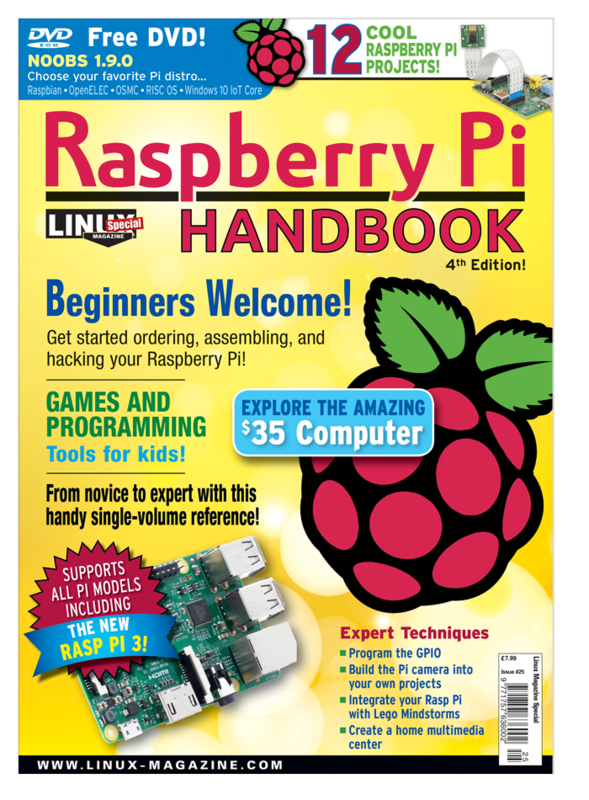 Welcome to the Raspberry Pi Handbook, a single-volume with all you need to install, configure, and discover the amazing Raspberry Pi computer. Read on for a gallery of exciting projects that highlight the best features of the Raspberry Pi environment. Sold Out: Due to the popularity of this special issue, the print edition is sold out. Please click here to order a digital copy. We describe how to assemble your Pi, install an operating system, and configure your computer. Raspbian is a fully functional Linux operating system. If you're new to the free Linux OS, this crash course will help you get your bearings. Explore the graphical user interface available for your Raspberry Pi system. The NOOBS boot manager helps beginners try out various Rasp Pi operating systems. Raspbian comes with an exciting assortment of desktop apps, games, and programming tools. Write cool programs with Scratch - a programming language for beginners. File service, automated backup, and print service for the home network. Test your web creations with a tiny Pi web server. With the free Kodi software, turn your Raspberry Pi into a media center with a fancy interface - and a whole lot more. Use SSH for remote connections to your Raspberry Pi. Get started connecting your Pi to external devices. A game to test your fine motor skills. Turn a Raspberry Pi into an IR remote control. Getting to know the Raspberry Pi I2C bus. Build a Raspberry Pi into your Lego Mindstorms projects. The new Rasp Pi display provides a compact option for viewing screen output - at a Pi-like low price of $60. Transform your Pi into a platform for classic gaming. The Raspberry Pi camera module opens up a whole new world of useful projects. Export ports, handle interrupts, and program the general-purpose I/O. Wolfram Mathematica and Wolfram language are pre-installed on the Pi.